You knew there would have to be parts to this story. No way you can list all that you get at Trader Joe’s in one sitting. Not only is the list long, but you’re bound to forget something. Trader Joe’s is not my only go-to shopping food store. Publix is, really. But there are things at Trader Joe’s that you can’t get anywhere else. Well, you can (say, olive oil), but it’s not the same (olive oil). When I picture myself shopping there I see a fast-moving bee-like dance bouncing from this shelf and that aisle like a fast-moving pinball game. If you see me there you might hear the pings and bells in my wake (watch out– full tilt is possible). I anticipate my entrance. I know what I’m gonna see first. Bouquets and bouquets of flowers. From $3.99 or $5.99 or somewhere in that price vicinity you can go home with an armful of flowers and beam every time you pass the dining table or the kitchen counter or the bedroom dresser for the rest of the week. My gotta-go-to areas: produce, cheese, frozen foods, aisle of olives-spices-beans-pasta-rice-oil, nuts & dried fruit (including popcorn, but more on that next time…I’m in a spell of not eating popcorn because so many people I know are breaking teeth on crunchy things and having high dental bills. I’ll wait till the scare passes to buy again Trader Joe’s (popped in) Olive Oil Popcorn…picture to follow eventually). 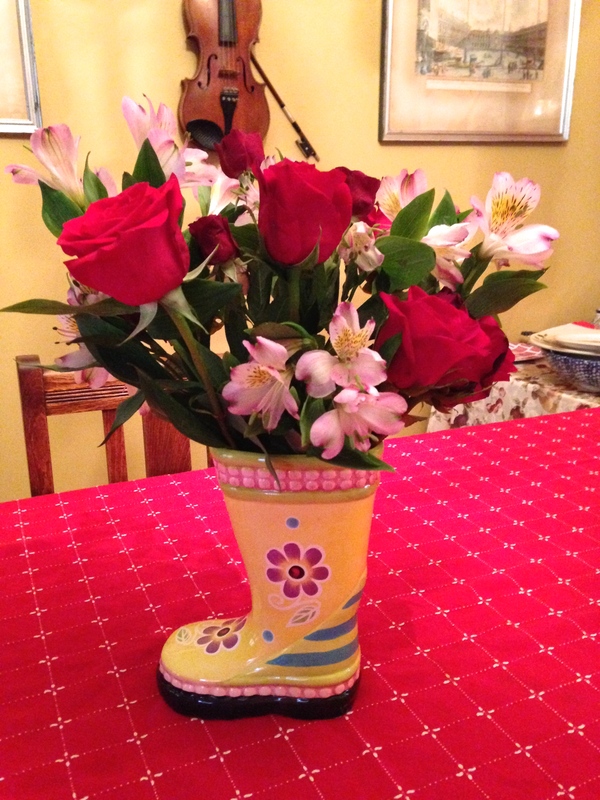 But here’s a typical $3.99 Trader Joe’s bouquet. RECIPE: Defrost and dry them with paper towels. Dredge them in seasoned flour. Shake off excess. Dip in beaten eggs and fry in a little oil until golden on each side. Try that. You will be FLOORED. 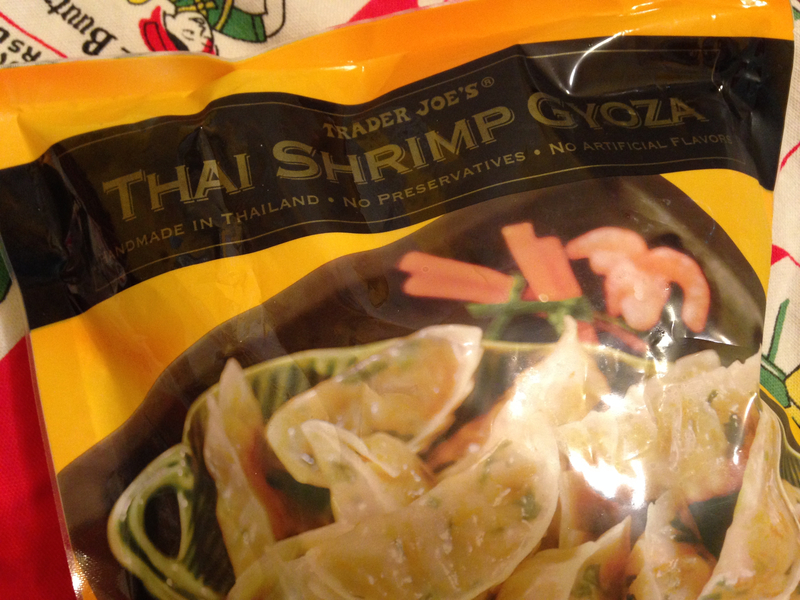 If you follow the directions on this package of Trader Joe’s Thai Shrimp Gyoza you will get perfect dumplings and no sticking. I make a dipping sauce of soy sauce and sweet chili sauce mixed together (maybe with a squirt of sriracha). It’s meal in a minute with transport-you-far-away exotic flavor. I like these because they are NOT sott’olio which gives them a nice clean taste ready for anything you WANT to add. (You never know what a manufacturer’s oil is gonna taste like, and then they add other flavors you may not want plus some ingredients you can’t pronounce because they have to preserve what they put in the jar.) 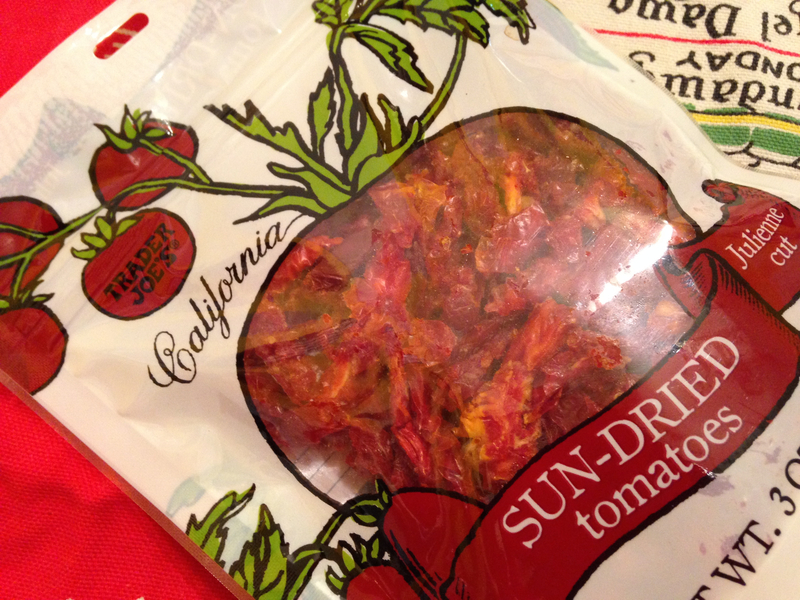 Ever have sun-dried tomato pesto? RECIPE: In the bowl of a food processor add a package of sun-dried tomatoes, a garlic clove (peeled & coarsely chopped), a handful of favorite fresh herbs like basil, mint, oregano, and/or sage. Pulse till minced. Add some olive oil (1/4 cup? ), salt & pepper. Pulse to smooth. Boil your pasta (capellini, spaghetti, or fettuccine might be nice). Place your pesto in the serving bowl and add a couple of spoonfuls of the pasta water (has pasta starch and salt and is a great “ingredient”) to loosen the pesto and make it more “sauce-y” then add your cooked pasta. Toss to coat. Sprinkle with grated parmigiano. Oh. So. Good. 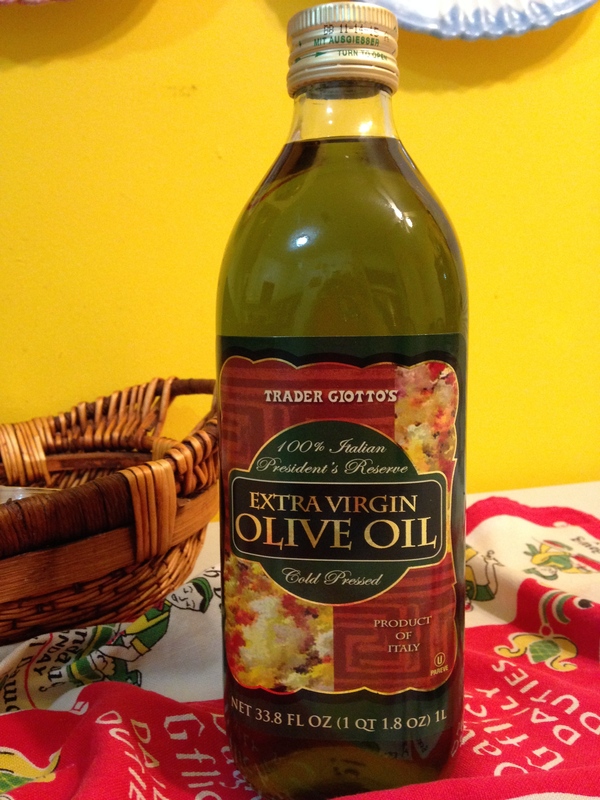 And when I say olive oil, I mean this: I’ve used Trader Joe’s President’s Reserve Extra Virgin Olive oil for years. I use it for everything: frying, sautéing, salads, even a little deep frying (a little…an inch or two in a small pot to just fry up small things like little arancini, small chocolate mini-pies, sage leaves, impromptu tiny zeppoles…nothing large or long-frying with olive oil). I love this oil. I’ve tried others and come back. And for $6.99 a liter it’s a great buy (plus it’s a product of Italy). That’s just the beginning. There’s oh-so-much more. 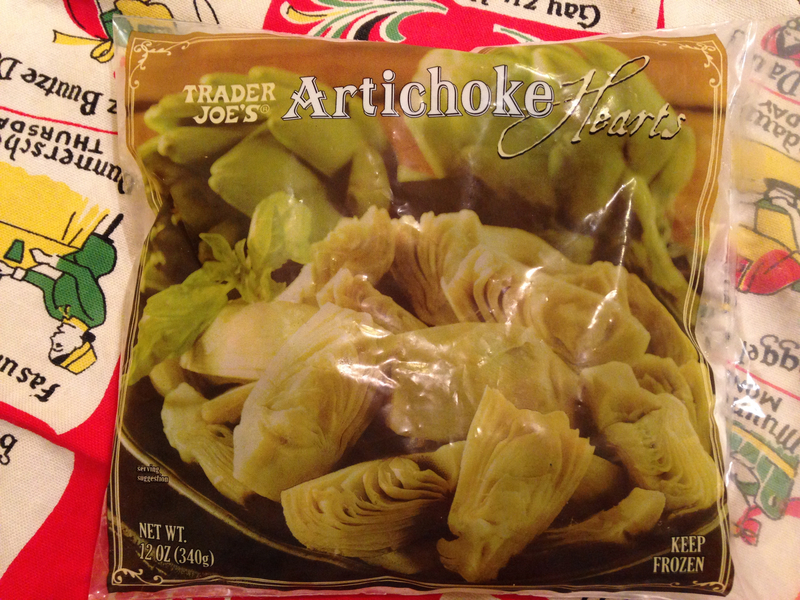 Stay tuned to future notices about my Trader Joe’s favs. And in the meantime — let me know YOURS!